Doha, Qatar – May 30, 2018: A report released today by Northwestern University in Qatar, that reveals long-term trends in news and entertainment consumption, social media preferences, and attitudes about the media indicates a lasting impact of the Arab Spring on media habits in the Middle East. 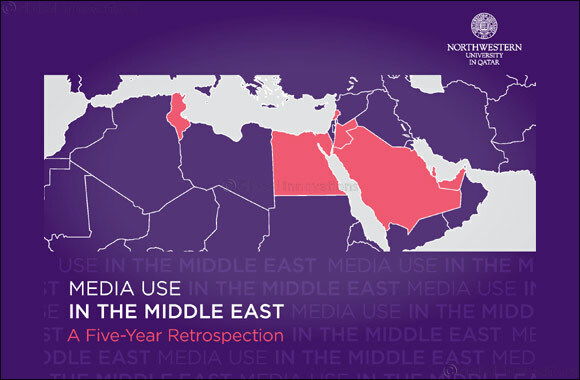 The study, which consists of findings derived from surveys of seven countries NU-Q conducted annually from 2013 to 2017, provides unparalleled insights into shifts in news and entertainment consumption, as well as social media use in the Middle East. Over five years, there have been nearly 30,000 face-to-face interviews with 5,000 conducted on the phone, covering between six to eight representative countries each year across the Middle East. Begun with internal funding in 2012-13, the studies have been supported by an initial $850,000 grant from the Qatar National Research Fund, which was recently renewed through 2020. Earlier, major funding for a three-year period came from the Doha Film Institute and other sources. At the same time, the belief that international news organizations are biased against the Arab World has grown. An average of 37 percent of Arab nationals thinks this. The five annual studies from which the report was drawn were produced by a research team that included Dennis (lead principal investigator), Justin Martin and Robb Wood (principal investigators) as well as Mariam Saeed and Najwa Al Thani (research assistants). In addition, the retrospection includes brief expert commentaries by leading media professionals, researchers, and scholars including Jeffrey Cole, director of the World Internet Project; Dima Khatib, managing director of Al Jazeera’s AJ +; and columnist and commentator Rami Khouri, as well as several NU-Q faculty researchers: Professors Banu Akdenizli, Ilhem Allagui, Khaled Al Hroub, Justin Martin, and Amy Kristen Sanders. Published annually since 2013, the Media Use in the Middle East study by NU-Q examines all forms of news and entertainment media with special emphasis on the internet and social media use, news consumption as well as attitudes and perceptions towards political expression on the internet, online regulation and privacy, entertainment and preservation of cultural values. A separate chapter offers a detailed focus on Qatar which has the highest internet penetration in the world. Each year the survey was conducted among 1000+ residents in each participating country and in collaboration with Harris Poll in conjunction with Pan Arab Research Center (PARC). Data from the report are shared with the World Internet Project at the University of Southern California’s Annenberg School for Communications and are the sole source of Middle East data for that biennial study. In the five years since the NU-Q Media Use project began it has become a major source of academic data and business intelligence for the region and internationally. Presentations of the annual survey are made at major academic and media industry meetings and shared with business, government ministries, and educational organizations the world over. Media coverage has been extensive and one commentator called studies the “most important single source” for understanding Middle Eastern media and their societies in the world today.